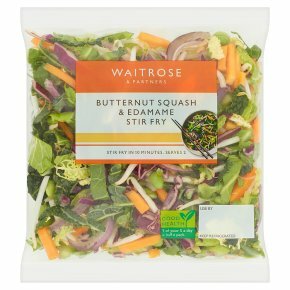 INGREDIENTS: butternut squash (27%), bean sprouts, red onion, edamame beans (soya) (13%), spring greens, red cabbage, savoy cabbage. Washed and ready to Cook.. Not suitable for microwave cooking. Do not eat raw. Washed and Ready to Cook. Time: 10-12mins. Heat dry wok for 2 minutes. Add 1 tbsp oil and add vegetables. Stir fry for 8-10 minutes until piping hot. Serve immediately. …Do not reheat.